Aerial photography: Aerial photography is the taking of photographs from an aircraft or other flying object. Platforms for aerial photography include fixed-wing aircraft, helicopters, unmanned aerial vehicles (UAVs or "drones"), balloons, blimps and dirigibles, rockets, pigeons, kites, parachutes, stand-alone telescoping and vehicle-mounted poles. Aerial refueling: Aerial refueling, also referred to as air refueling, in-flight refueling , air-to-air refueling (AAR), and tanking, is the process of transferring aviation fuel from one military aircraft (the tanker) to another (the receiver) during flight. The two main refueling systems are probe-and-drogue, which is simpler to adapt to existing aircraft, and the flying boom, which offers faster fuel transfer, but requires a dedicated boom operator station. Aerial tramway: An aerial tramway, sky tram, cable car, ropeway or aerial tram is a type of aerial lift which uses one or two stationary ropes for support while a third moving rope provides propulsion. With this form of lift, the grip of an aerial tramway cabin is fixed onto the propulsion rope and cannot be decoupled from it during operations. 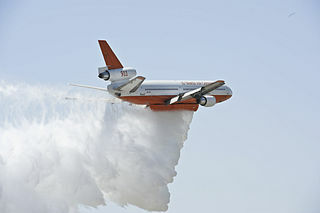 Aerial firefighting: Aerial firefighting is the use of aircraft and other aerial resources to combat wildfires. The types of aircraft used include fixed-wing aircraft and helicopters.